The Bush administration has so far taken only perfunctory steps to prod Pakistani President Pervez Musharraf to lift “emergency rule", reinstate the constitution and hold elections. Doing anything more, the US seems to fear, might produce an Islamist victory at the polls—and undermine a key ally in its war on terror. In effect, the old foreign policy bogeyman of the “fear of the alternative" is back in the White House. But at least with respect to Pakistan, this fear ought to be banished. If anything, the longer Musharraf is allowed to suspend democracy, the more politically powerful Pakistan’s religious extremists are likely to become. Those who doubt this thesis should peer across Pakistan’s southern border and examine what happened during India’s two-year flirtation with Emergency rule in 1975. Like Musharraf, India’s then prime minister, Indira Gandhi, declared Emergency after a court invalidated the elections that had brought her to power, on grounds of corruption and fraud. But instead of stepping down, she gave herself extraordinary powers and launched a massive crackdown on every democratic institution that India had painstakingly built since its independence from the British in 1947. Shutting down these institutions had a perverse side effect from which India’s secular democracy has yet to fully recover: it left the field of resistance open to Hindu extremist groups such as the Rashtriya Swayamsevak Sangh (RSS) and its then political front Jan Sangh, allowing them to regain the political legitimacy they had lost after one of their erstwhile recruits assassinated Mahatma Gandhi. The RSS was banned shortly after the assassination, but once the ban was lifted, it decentralized its organization further, making it harder for authorities to keep track of all its activities. The RSS quasi-underground character proved to be a vital asset after Indira Gandhi choked off all regular channels for political organization. Unlike the other parties, Jan Sangh was quickly able to mobilize the nationwide network of RSS shakhas, or highly disciplined cadres, and take over the mantle of resistance. It temporarily suspended its ideology of “Hindutva", or Hindu nationalism, to make common cause with what it dubbed the “second struggle for independence". It played an important role in producing and disseminating underground literature chronicling Indira Gandhi’s excesses, publishing speeches by her opponents and reaching out to families of arrested dissidents. The upshot was that once the Emergency was lifted and elections called, Jan Sangh declared itself the saviour of Indian democracy and won a prominent place in the coalition of secular parties that ultimately defeated Indira Gandhi. A similar political mainstreaming of radical Islamist groups might occur in Pakistan if Musharraf is allowed to prolong his power grab. 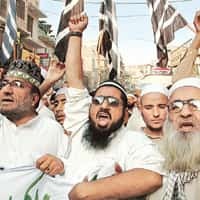 In fact, the situation could be worse, given that, unlike India, Pakistan has never been a secular country and Islamists have always exerted considerable behind-the-scenes influence on government. They have infiltrated thePakistani intelligence services and are well represented in the ranks of the civil bureaucracy. The one government institution where Islamists have only a minority presence is the Pakistani parliament. But that might change if Musharraf continues to postpone elections and crush political opponents. Under such circumstances, Jammat-e-Islami (JI), Pakistan’s oldest religious party with ties to the Taliban and its sister organizations might well become useful to secular parties such as former prime minister Benazir Bhutto’s Pakistan Peoples Party. The JI and its cohorts command even bigger powers of mobilization than Jan Sangh did during India’s Emergency. “Instead of the secular and religious parties working against each other, they will start working together," fears Prof. Hasan-Askari Rizvi of Punjab University in Lahore. Indeed, the Associated Press has already reported that Bhutto is inviting the Islamist parties, many of whose members, too, have been thrown in jail, to “join hands" with her. All of this will allow the Islamists to mask their real agenda and piggyback on a popular cause to win more representation in parliament when elections are held. Even if secularists such as Bhutto prevail in these elections eventually, it will be much harder for them to resist Islamist demands if they are beholden to them for beating back the emergency. In effect, the Islamist reach will not only gain in depth—but legitimacy as well. If Musharraf were prodded to call off the emergency and honour his commitment to hold genuinely free and transparent elections in early January, would that lead to an Islamist victory, or at least significant gains, as the Bush administration fears? Not at all. Islamist victory at the polls is not a real threat in Pakistan right now. The Bush administration should not allow that fear to deter it from applying maximum pressure on Musharraf to hold elections post-haste. Yet another prolonged suspension of democracy will leave Pakistan few resources to beat back its Islamists.